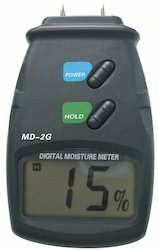 Offering you a complete choice of products which include wood moisture meter. We provide a wide array of Wood Moisture Meter, which is used to measure the amount of water in wooden object. These meters are also used for measuring moisture levels of building walls, plaster etc. Our range of wood moisture meters are highly acknowledged in the markets for the features like compact designs, accurate measurement and light weight.